The Holey Galahad® Premium Kit is our most aggressive kit as it contains the Round Extreme Coarse Purple (REP) which is excellent for rapid removal and shaping, especially for convex and concave areas. Not as fast in removal and rough shaping as any of our Lancelot or Squire chainsaw blades, it comes close! Combined with the Round Coarse Blue (RCB), then progressing down to the Round Fine Green (RFG), the Premium Kit also includes a Flat Medium Red (FMR) to shape predominantly flat areas. The individual item descriptions contain specific information on usage and technical data. For orders of more than two (2), please call 1-800-942-1300 for US buyers and (850) 877-7650 for international buyers. POWER CARVING KITS are choice selections of our most popular accessories and have been tailored to repetitive individual enquiries received over the years. These sets also offer a discounted price compared to individual purchases. The Holey Galahad Premium Kit is our most aggressive kit as it contains the Round Extreme Coarse Purple (REP) which is excellent for rapid removal and shaping, especially for convex and concave areas. Not as fast in removal and rough shaping as any of our Lancelot or Squire chainsaw blades, it comes close! Combined with the Round Coarse Blue (RCB), then progressing down to the Round Fine Green (RFG), the Premium Kit includes a Flat Medium Red (FMR) to shape predominantly flat areas. FEATURES: Nothing shapes wood better! From bowls to bears to artistic sculptures to log homes, furniture making, and taxidermy – anytime you need to get a final shape, whether flat or contoured, Holey Galahad® can help bring your vision to reality. Holey Galahad® features patented carbide teeth that move effortlessly with or against the grain on all types of wood. These extremely sharp, long wearing conical teeth provide superior surface removal with a very smooth action, making Holey Galahad® easy to control. TECHNICAL: Made in USA. Designed to fit most 4-1/2” (115mm) and Metric 125mm angle grinders. Maximum 14,000RPM. All discs are 4” (100mm) in diameter with 7/8” (22mm) center holes and feature patented structured tungsten carbide teeth bonded to steel discs over the total cutting surface. Tungsten carbide needles manufactured in a 5-stage patented process. Using King Arthur’s Tools Universal Nut, you can seat any model Holey Galahad, but the Universal Nut is specifically required to fit the round profile discs over the arbor. 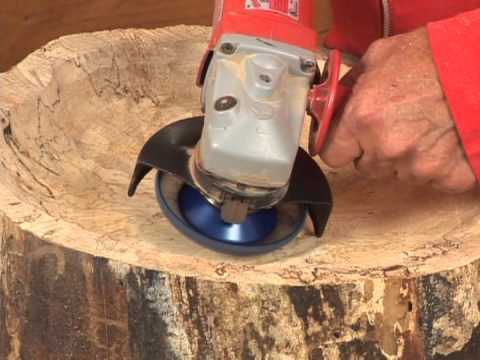 The depression in the universal nut seats over the arbor of the angle grinder and securely tightens the disc. The KAT Universal Nut also seats snugly into the deep well center of Holey Galahad. Tighten the hexagonal head of the KAT Universal Nut using a 21mm spanner or our KAT Universal Wrench. Specifications: Please specify your choice of either the 5/8” (16mm) standard or 14mm metric Universal Nut for your angle grinder. All kits include a Universal Nut.